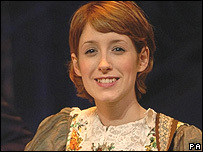 Connie Fisher, winner of the BBC's How Do You Solve A Problem Like Maria?, made her West End debut in the Sound of Music on Wednesday night. The 23-year-old beat nine other finalists to win the lead role in Andrew Lloyd Webber's revival of the Rodgers and Hammerstein's classic at the London Palladium. Despite initial scepticism at the way Maria was chosen, Fisher's opening night performance charmed the critics. Connie Fisher, the West End lead they chose off a BBC telly show, confronted and conquered her mountain last night. The smart set said she'd crumple. London arts darlings tutted and tsked, displeased by - my dears - the vulgarity of it all. But sweet, clever Connie knocked 'em flying. Viewers of Britain, you chose well. She's as natural and unsugared and wholesome as one of those pots of vegan yoghurt. Just listening to her makes you feel healthy. Connie Fisher overcame a nervy start to give a fine singing, and even acting, performance as the nun-turned-governess and governess-turned-wife, Maria. And Alexander Hanson was so sound as her employer-turned-husband, Captain von Trapp, that he could have been playing the role for as long as box-office success will surely compel him to perform it. Whatever one thinks of the process of casting a lead role through a TV elimination game, the truth is that Connie Fisher ("the people's Maria") occupies the Palladium stage with absolute confidence and winning charm. For a start, she is around the right age 23... but Fisher also brings exactly the right qualities to the pesky postulant who first becomes governess to the von Trapp family, and then her employer's wife. The only people likely to be less than jubilant about this latest addition to the West End's miracle season of musicals are the producers of other top-notch shows. In their offices this morning there'll not be the sound of music, but the sound of moaning. [Connie Fisher is] enchantingly fresh and ardent and she sings with a voice that can range from piping purity to soft tenderness. [Connie Fisher] makes an absolutely enchanting Maria in Jeremy Sams's opulent production, handsomely designed by Robert Jones, that pays Rodgers and Hammerstein the compliment of taking the musical seriously, never once descending into camp. Indeed, getting on for half a century after the piece's premiere in 1959, this is a show whose time has surely come again. Its decent, wholesome values, its celebration of the family, its unembarrassed portrayal of devout Christian faith and its vision of good outwitting the evil of fascism all seem exceptionally welcome in these troubled, cynical times.